While we’re not talking T. S. Eliot-level poetry here, in 1964 it was definitely a cut above “She loves you – yeah, yeah, yeah”! With Woody Guthrie as his model, Paxton was romanticizing the lives of the 1930’s Depression-era hobos riding the rails across a broken America in his very traditional folk song which sounded like it had been written long decades before. I was about seventeen when I discovered Woodie Guthrie’s autobiographical Bound For Glory at the public library and that book – and Paxton’s songs – made a big impact on my developing sense of the world. It may have been the Summer of Love and “acid” in San Francisco but the songs of Woody Guthrie and Tom Paxton spoke more directly to me, a miner’s son growing up in a hard rock town in northern Quebec. I’ve had the rambling’ boy bug all my life. I had it when I was five years old and hanging on to the inner tube of a car tire along with my friend Veshu about fifty meters from the lake shore where our families were picnicking. We were on our way to a nearby island when my father swam up and very carefully pulled us back to the beach! My father Stan and little brother Martin and Kurt Wilke on the right. Herr Wilke was a Berliner who served in the German Army; he was imprisoned in Russia for six years when captured in 1945. Meanwhile, my father, a Polish soldier who was captured in the streets of Warsaw in 1939, spent six years in German POW camps. 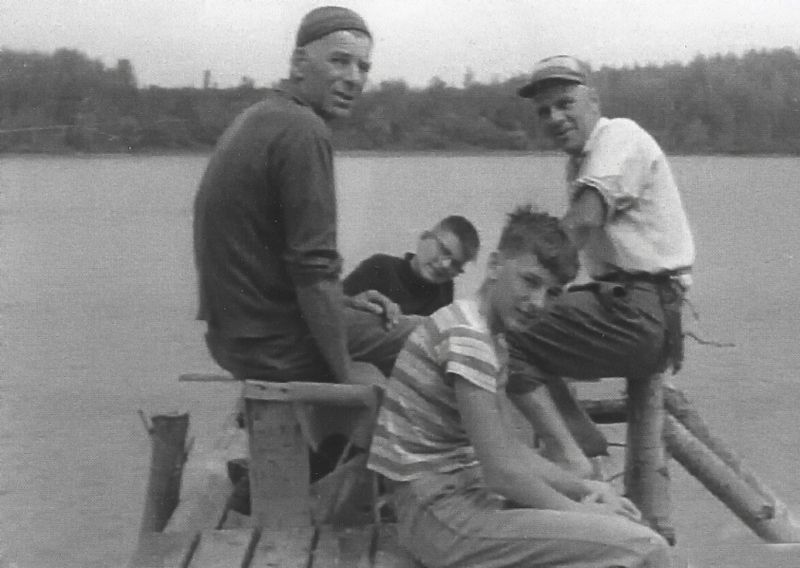 Here they sit together on a dock in northern Quebec in 1961! I still have that ramblin’ bug sixty years later. It has shaped the things I love to learn about – i.e. all of the humanities from languages to world history to world religions to anthropology, politics, and economics. 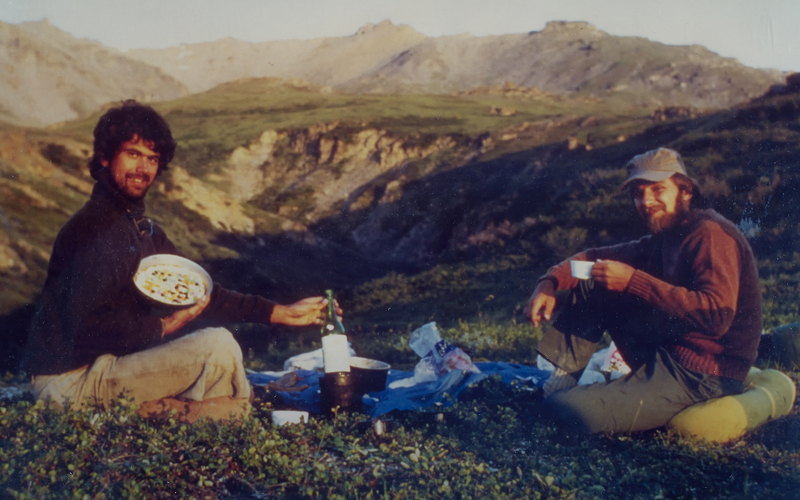 It has definitely shaped the things I like to do with my spare time – wilderness canoe tripping, bicycle touring, hiking and mountaineering, and working out regularly at the gym so that I can do all that other stuff and enjoy it. It has ushered me into some incredibly beautiful (and maybe even sacred) places where few get to go because of the time or effort required. Not everyone has the ramblin’ bug and they have used their time and money – and their good health – to indulge in other pursuits. That’ s just the way it should be. But for me, there is nothing like the feeling of standing at the end of the road or the side of a railroad track with a backpack or canoe on my shoulders…and knowing that the adventure is about to begin! Without getting overly philosophical, I hope to share some of what I’ve learned in some of these recent adventures, as well as show some of the pictures I took along the way. The teacherly tone that comes from thirty-five years spent in front of mid-to-late teenagers in various classrooms will occasionally be evident! If my posts encourage other travellers to step out of their front doors and embrace what has so far been unknown to them, that would be the best of all! you can know the whole world. you can see the way of heaven. accomplishes much without doing anything. And then I think back to his own life. The collection of poems we know him for only came to be because a border guard insisted that he write down the essence of his wisdom before he left the Middle Kingdom and continued towards the Himalayas on his water buffalo. After crossing the border he was never heard of again. Lao Tzu – the ramblin’ boy! Of the petrel and the porpoise. In my end is my beginning. So it’s off we go on our own chosen trails, with this blog being a collection of my more recent trips from home! As Tom Paxton put it fifty years ago – May all your ramblin’ bring you joy! on the banks of the Yukon River with some fellow ramblers! Great pics and stories on your Holguin/east bike trip. All those pics are so familiar. I am down there regularly doing the same rides. Really enjoyed reading your detailed article! Jeff, it is nice to hear you enjoyed the posts. I put them out there in the hope that they might do the same as the posts that I read before I decided Cuba was a good cycling destination. As you know, it was absolutely the right choice! By the way, “props” for your work with bikesforcuba. I had heard about the work you guys do a few years ago when I took Narayana Reddy’s bicycle repair course at Central Technical School. I was wondering if I might be able to use your photograph of El Chaltén (“the road into El Chaltén with Cerro Poincenot (3002m) and Monte Fitz Roy (3405m) behind”) on my website, Switchback Travel. Beautiful shot. We were just there but didn’t quite have the weather on our side on that day. Thanks! David, I just noticed that I approved the comment but didn’t respond. I am sure I sent you an email but just in case – yes, of course – make use of the shot. Just put a small indication of where you got it. Without a doubt the weather in southern Patagonia can be unpredictable! Debbie, feel free to share the pic. Putting my home page url would be more than enough credit! Perhaps the most amazing beach I’ve visited – the 10-kilometer stretch of wild shore of Vancouver Island from Tofino to Wickaninnish called Long Beach- has incredible driftwood strewn about. I remember spending some time trying to frame just the right shot as I cycled it from one end to the other. We live on Vancouver island and that beach is incredible. Interesting to read this as I was mainly looking at your blog regarding your trip to Nepal which is fabulous. 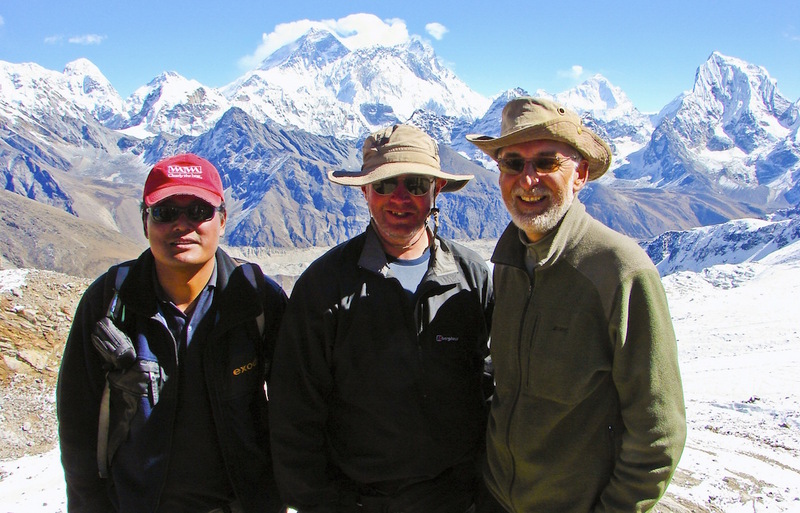 We did Everest/Gokyo a few years ago and now are doing Three Passes in fall 2015. Its amazing that there are so many places to go in the world but we cannot help but to return there…. We are in our early fifties and also feel that we can only do those challenging hikes for so long so its important to go while we can. We do a lot of kayaking off the coast of Vancouver island so if you loved that beach in Tofino, you would LOVE the private beaches all up the west coast of the island. Just as gorgeous without a soul around often. Magical place. Thanks for your blog, its very well done and informative. I meant the link to the beach photos…the 10-kilometer stretch of wild shore of Vancouver Island from Tofino to Wickaninnish called Long Beach- has incredible driftwood strewn about. Ah, the link to the post on Long Beach! There is no post and unfortunately I’m not even sure where the pix are! It was back in 2004 before I turned to digital photography so I am sure they are in a box somewhere! You’ll just have to go and see for yourself! Thanks for the info and very helpful information on your website and the post on Lonely planet for Patagonia! I tried replying to the topic I asked 2 days ago but they somehow deleted the thread, maybe they thought my flickr account is some sort of advertising…So I thought I will post here instead. Anyways, back to Patagonia, the purpose of my trip is photography and I’m more of a photographer than a hiker. I have done hikes in Iceland and North America and Canada but not really experienced with camping. It’s very important or me to be at the places during sunrise and sunset. After looking at most of the best spots, it looks like they all require hiking and perhaps camping, especially in El Chalten. So would it be best to say that I should just hire a car in Puerto Natales (or is Punta Arenas cheaper?) for few days in TDP, take bus to El Chalten, hike, take bus to El Calafate, rent a car to drive to the glacier for sunrise, bus back to Punta Arenas? As for accommodation, in TDP should I just stay 2 nights in Puerto Natales, drive along some scenic spots (Lago Pehoe, anything else), do 4-5 days W trek. I assume I need to camp or stay in Refugios for the shots. For El Chalten, I suppose the only way is to camp or stay in Refugios to avoid walking hours in the dark…. I really would prefer to stay in Refugios with a proper bed, but are they still too far from the sunrise/sunset locations in TDP and El Chalten? I wouldn’t mind 30 minutes walk in the dark but nothing more than that. I know that TDP is one of the most expensive place to stay, but what about staying in the refugios there, would $50 a night be enough? And do you have to book and pay for camping or is it free? Here’s some of my shots from my previous travels, I’m on a 2 months trip starting Feb next year and will be going to Arizona, Utah, Canadian rockies, Yellowknife or Whitehorse for aurora, Salar de uyuni and Patagonia. Seeing that you are from Canada, would love to travel with you to the Rockies if you happen to have time. Aaron, the sunrise/sunset requirement does make it a bit more difficult! BTW I took a look at your picture sets and can see you’ve got some great dawn/dusk shots from some amazing places, lots of “wow” moments for sure! In the mountains just west of El Chalten unfortunately all the great spots to be require you to be camping unless you want to leave your room in El Chalten at 2 or 3 in the morning! I’d have to say the same about Torres del Paine. This is not to say that there aren’t other great miradors (viewpoints) that photographers haven’t found. The entrance to El Chalten from the east, for example, might make a nice sunset shot. From the road going through TDP Park there are undoubtedly some fine spots from which to frame memorable shots. Having said that, I am sure it is possible to find some great vantage points from further away that would still allow you to get some stunning shots. Take a look at the following set of Patagonia pix by another photographer, Ian Plant – many of them sunrise or sunset – and you’ll be looking at what you are after! It is a bit more than $50. a night but you’ll be there in prime time (February) and would have to prebook to be absolutely sure of getting a bed. While I tented my way around the TDP circuit, I did make use of the refugio restaurants whenever I could, keeping what food that I had for situations when there were no restaurants available. Having a tent gives you a fall back if the refugio is totally booked. You do have to pay a camping fee- it is something in the order of $10. You also have to pay a $38. park entry fee at TDP; the hiking trails out of El Chalten are free. Aaron, I’m sure I haven’t answered all your questions. You’ve got a few months to get a better handle on things and how to do them. In the end, you will go down there and, given your eye for framing interesting shots, you’ll come back with a memory card full of great pix. Hi true_north! Thanks for the like and follow. I am loving your blog here, and can totally relate to your ramblin’ boy bug. Many of my friends have chosen to focus on other things in life but to me the sense of adventure is incomparable. I’ll be making a long extended trip to South America towards year end so I’ll be checking in to your blog very often! Drop by South East Asia sometime! Hey Peter. Had you as a history teacher about a decade ago at EY. Your lectures and stories about your travels were always fascinating. Keep up the great work! Jen – is that Jen C? – nice to hear from you! It’s always nice to hear from old friends. You use the word “decade” and it sounds downright historical! I hope the passing years find you happy and fulfilled with your journey so far and the twists and turns it has taken. Let me know when your blog is up and running! Alex, from your email handle i am assuming “canoe trip”! It is never too early to work on the logistics for the next big adventure. Send any questions to true_north@mac.com and I’ll try my best to answer them. I’m planning a trip to Wabakimi and have some questions. Could we arrange a telephone call? Rob, Wabakimi is a great canoeing park! I just emailed you my phone number. Talk to you later. Hello. How does one get a hold of you to chat by email? I would like to use some of your photos from your adventures in the Temagami area as reference photos for some of my paintings. Can you please contact me. Shirley, feel free to use any of the photos that inspire you to put brush to canvas. Perhaps you’ll remember this post when your painting is done and you’ll send a link – if there is one! – to the digital image! My nephew alerted me to this site and I am blown away by the depth and breadth of your research on Morrisseau/Dewdney. I share your love of the north and among other interests, spend about 5 months a year in the Chapleau area prospecting. At age 11, I complained to my father that my older brothers had more interesting names than me and so he offered that if I wanted a middle name I should just choose one. I chose North. I live on Ward’s Island and would be thrilled if you dropped in if you ever get out here… and looking at your travels in Toronto, I’m sure you do. 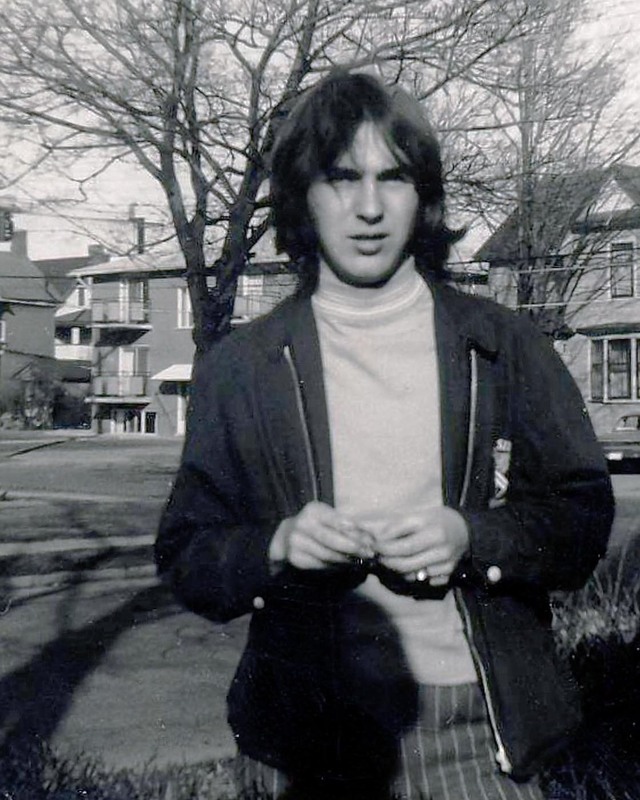 I spent a few summers with dad on what my mother termed “expeditions” the most interesting one included recording James Redsky’s interpreting the Midayewin Initiation scrolls and his oration of the Ojibwe Creation “myth”. Peter, it is nice to hear you liked the post on the pictographs. Your name has certainly popped up a number of times as I have read through one or another of your father’s books. Ever since I first found a copy of Indian Rock Paintings of the Great Lakes my life as a retired teacher has included what most would call an obsession with pictographs and anything written by Selwyn Dewdney. It certainly has been an education and one for which I can thank your father – and bow paddlers with names like Chris or Keewatin or Peter! It’s funny that you should mention Chapleau. My brother and I just spent 45 minutes on Skype looking at the Google Earth map of the Little Missinaibi River that we plan on going down from Healey Bay on Lake Windermere to access Little Missinaibi Lake. 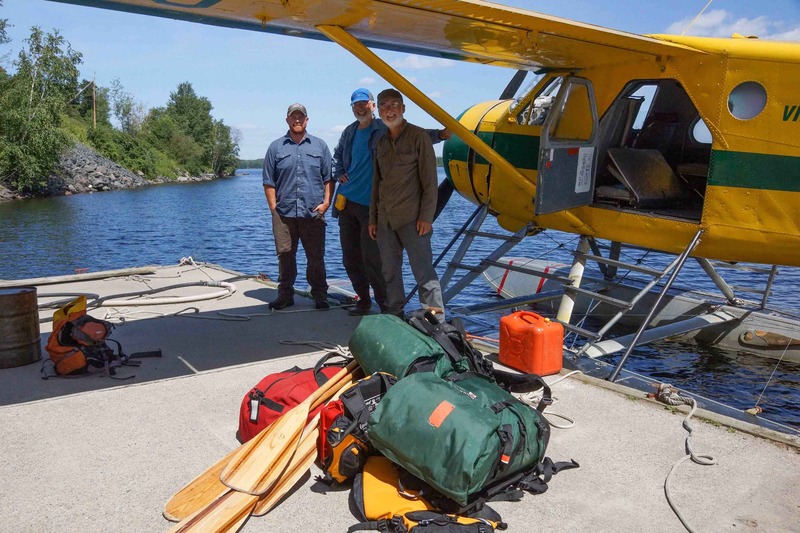 We want to see the pictograph sites there and then paddle down to Fairy Point and on to Missanabie where we would catch the Budd car back to Chapleau. Peter, one day soon Viggo and I will hop on that ferry for an island walk and visit. Stumbled across your blog while looking up possible cycling routes from Bowmanville to Ottawa as I am considering a route this summer. In doing so, it looks like I have found another blog to enjoy reading! Lynn, nice choice for a scenic ride! The route along the lake via Prince Edward County and then the St.Lawrence down to Brockville and up to Ottawa is one that I’ve done a couple of times. There are a gazillion other route options! BTW – nice blog! Just got knee deep into it but there is more to check out! Gotta love WordPress for making it so easy for us to share! The thought of the route from Brockville working up towards Ottawa intimidates me a wee bit as I suspect there is some climbing involved. Not a huge fan of hills but I suppose it is inevitable I learn to develop a better relationship with them! WordPress is such a wonderful forum to share information & stories. I could never imagined the wonderful friendships & the people I would connect with through blogging. Love your play on words with the knee deep in it! I was a sight to behold, that’s for sure! What you want to do is focus on all the downhill parts – of which there will be a bit! Have a great ride! Not so bad, eh! Do it over two days – Merrickville is a pleasant little spot to spend the afternoon! Brigit – Groeten uit Toronto, Canada! Every time I see that photo I think how lucky I was to spend a night there. Feel free to use the photo! Let me know if you need a larger mb file for publishing purposes. If you had an opportunity to do a 10-day guided trek to Cordillera Blanca or Huayhuash, which would you choose? I have time off from work that i’m carrying over into next year and i’m considering one of these two treks through tour agencies. I’m not sure when i’m going to get this opportunity again. I have backpacked throughout the Rockies and completed the TMB. I’m in good physical condition and have handled altitude well in the past, although I realize the importance of acclimatizing. My passion is beautiful mountain scenery, jagged peaks, glacier covered mountains, and photographing such locations (hobby). Appreciate any advice you may have. Habeeb, I think I’d choose a compressed trek in the Cordillera Huayhuash. The one I did was 16 days but there are shorter versions that try to give you “The Best Of The Huayhuash” in less time. Hopefully it will only be the first of your many visits to the Cordillera Blanca so what you don’t do the first time you can do in the future! You’d need a two-week vacation to fit it all in – a flight down to Lima; a day to get up to Huaraz by bus or – if you are willing to spend a bit of $$ – a 1- hr. flight up to Huaraz; a couple of days of acclimatization in Huaraz with walks above the town to help in the process; and finally, the trek itself. There are some good local Hauraz and Peruvian agencies in the town that can handle your trek. Ideally you want to join with others since the price will be determined by how many clients are on the trek. Re: trekking agencies. There are a number of reputable ones out there. Unless they have completely fallen apart since I used them i can highly recommend Peruvian Andes Adventures. Why not check tripadivsor to see what recent clients of theirs are saying? Good luck with your plans. The organized trek approach is a good one since it will allow you to spend the day walking with your camera gear and focusing on your photo-ops while the experienced local crew deals with the logisitics and the moving the infrastructure and your baggage. I was wondering if I could use a photo of yours (with attribution to you) to advertise a series of talks among Quakers in Ottawa called The Waters of Reconciliation? The photo I’d love to use is of the Ottawa River near Arnprior (https://albinger.me/2016/09/20/canoeing-the-ottawa-river-from-fort-coulonge-to-ottawas-rideau-canal-intro-maps-and-planning/). Thanks for considering this request! Thank you. You are very kind, and a great photographer to boot. The image should mean a lot to Ottawa Quakers because the Ottawa River is something we see every day; your photo really captures and highlights its spiritual side.